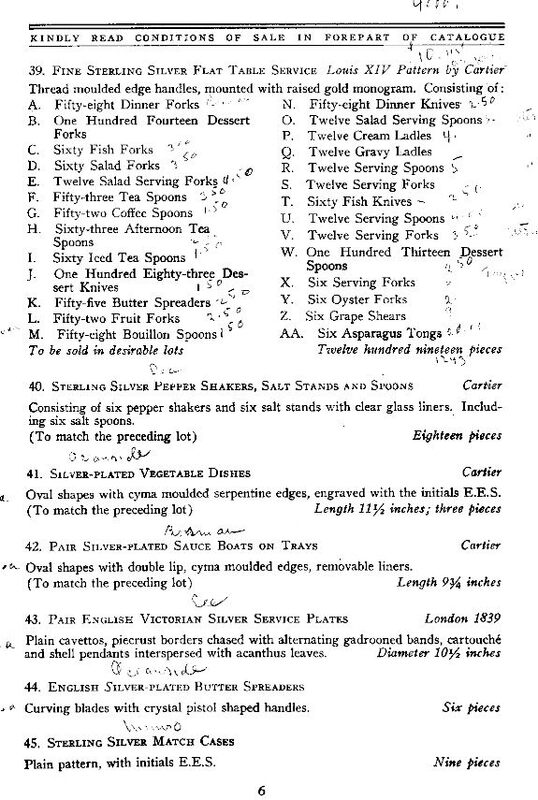 A sense of the Stotesbury’s simple summers by the sea can be gleaned from the 1946 Wingwood auction catalog, where table linens are listed by the mile, and silver flatware, dinner china, and crystal were listed by the hundreds and thousands of pieces. Inside Wingwood House, the merry aesthetic confusion of the exterior continued. 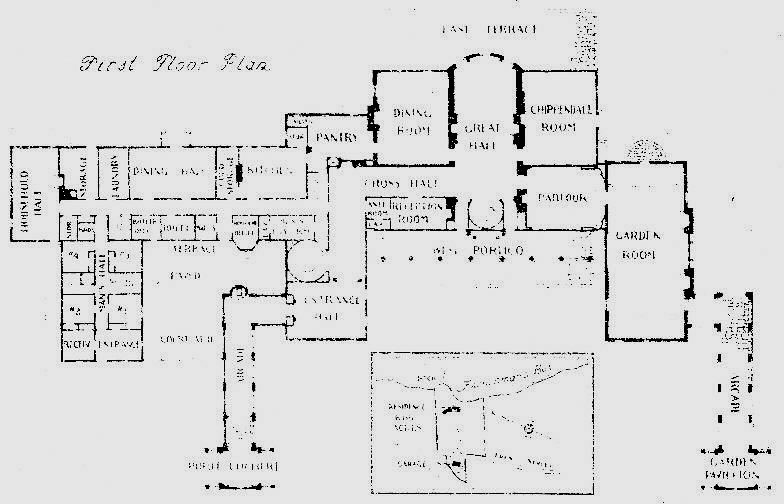 The architects, Magziner, Eberhard, & Harris, were primarily theater architects, and the complex floorplan suffered from being the remodel of a very large house to an enormous house. 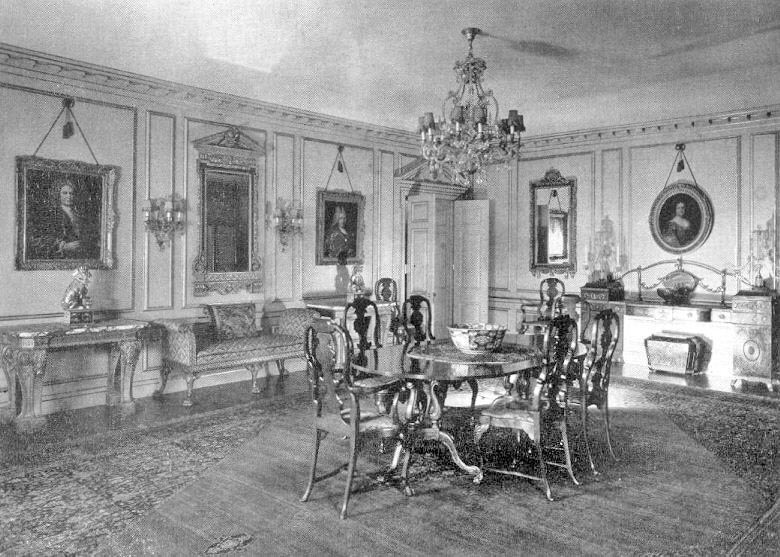 In an interview with James Maher, Mrs. Stotesbury’s son, serial heiress marrying James Cromwell (Delphine Dodge, Doris Duke ), remembered that while Lord Duveen had supplied much of the art and furnishings, the interiors were the work Philadelphia decorator Gustav Ketterer, who had also worked on a restoration of Independence Hall. 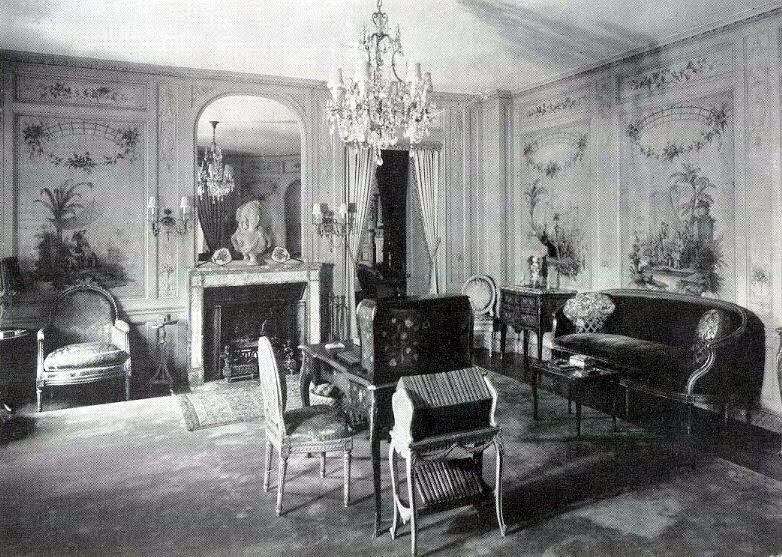 Interestingly, Lord Duveen did supply an eighteenth century French drawing room for Hauterive, the neighboring Miles Carpenter estate just north of Wingwood. Despite the building’s strict symmetry, the main entrance was not in the center, where a false door was located, but in the North arcade that shielded the large service wing from the public areas. 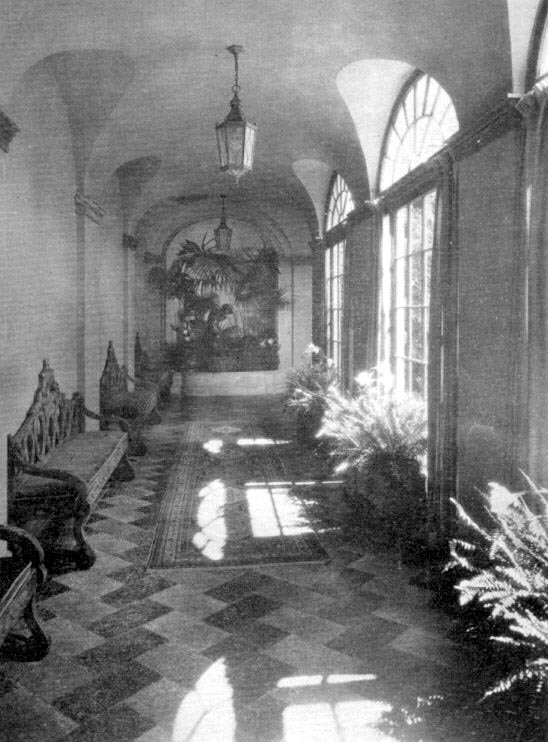 One entered under the Porte Cochere with its roof copied from Mulberry Plantation, and from there down a long arcade, floored with Zenitherm, a material much beloved by designers in the jazz age. There was a room in the service wing overlooking the driveway, staffed by the switchboard operator. One of her tasks was to alert the butler when cars entered the gate, so he could already be opening the door as a chauffeur discharged passengers under the porte cochere. The four 18th century painted Gothick benches, redolent of Strawberry Hill, are enviable. One would then turn right into the entrance hall (not pictured), then turn left into another long hall. 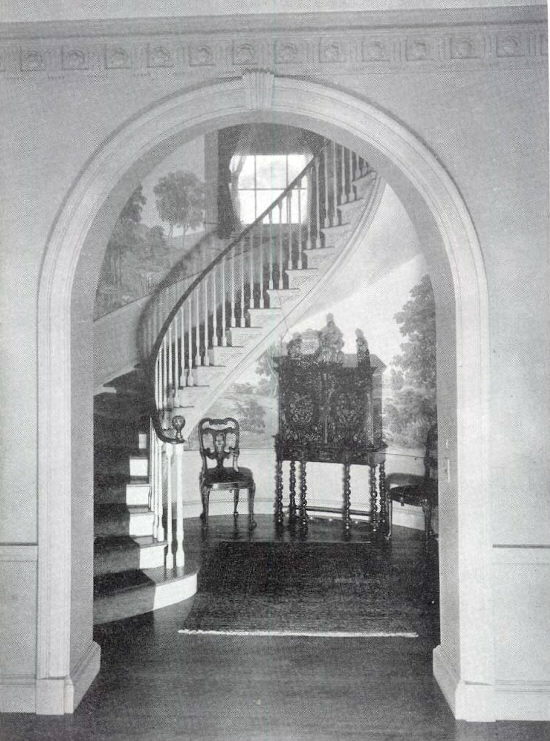 One would pass the North stairhall, with its scenic wallpaper and curving staircase. Why Red Hall, I don’t know. 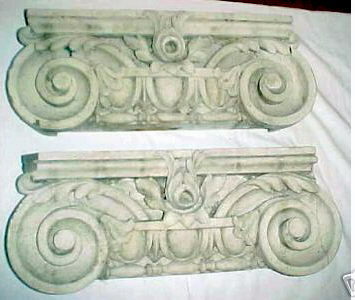 I once owned a pair of the columns salvaged from the demolition, as well as the sofa seen here. 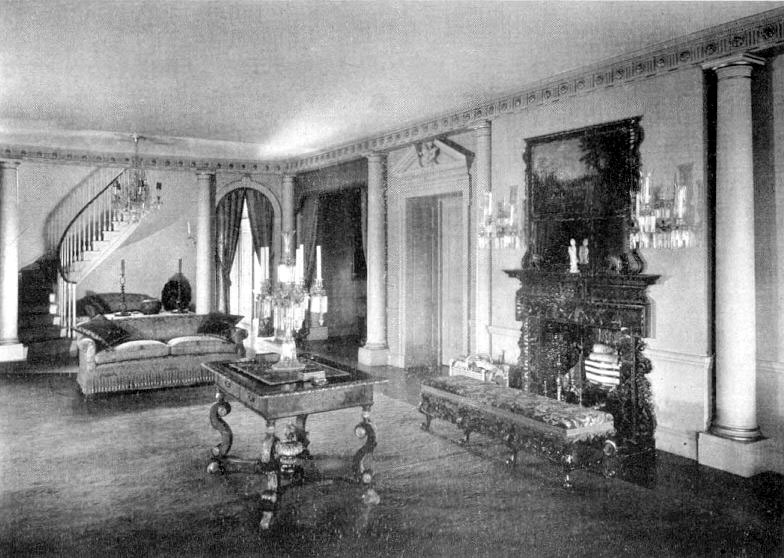 The columns were painted a traditional Georgian green, and the sofa was upholstered in emerald green damask. 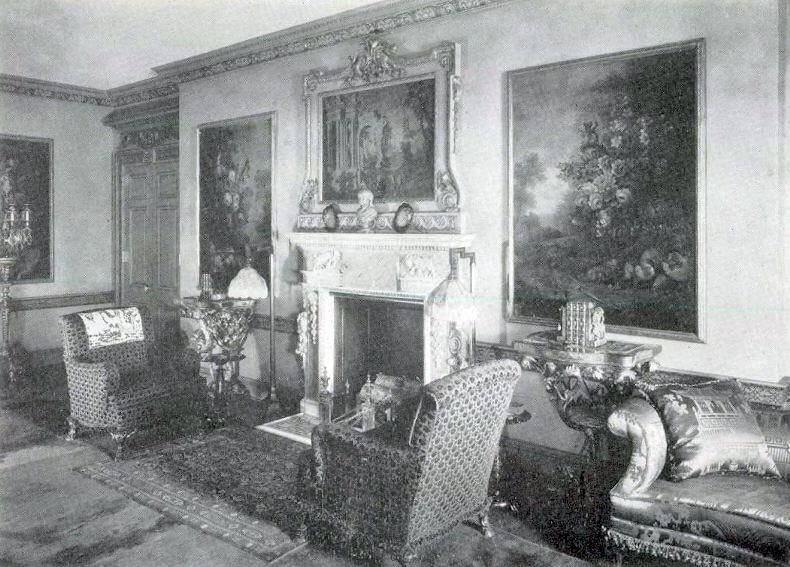 To the right was a large dining room, with English portraits purchased from Duveen. The scale is deceptive. Although the rooms look low, the ceiling heights were about 12 feet. 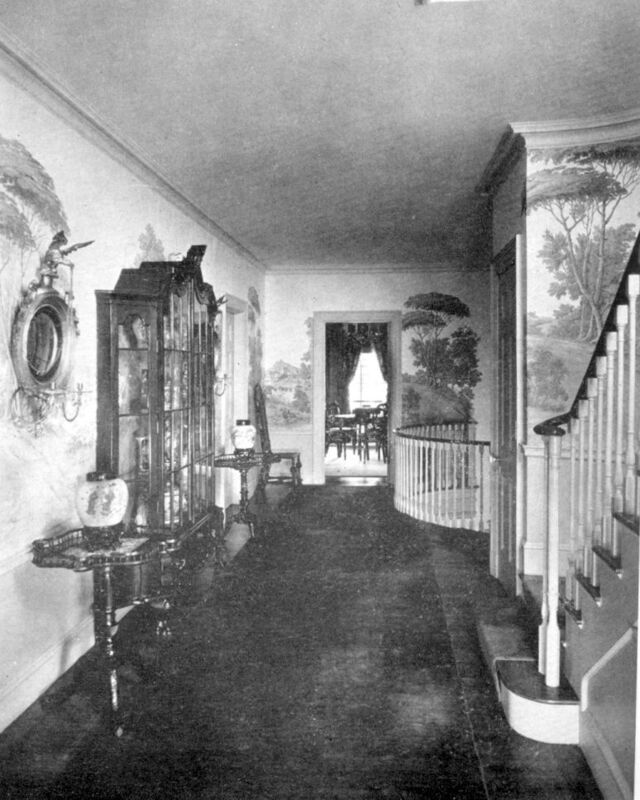 Across the Hall from the Dining Room was the Chippendale Drawing Room, with the finest of the house’s English chimney pieces, and some very dated lampshades. 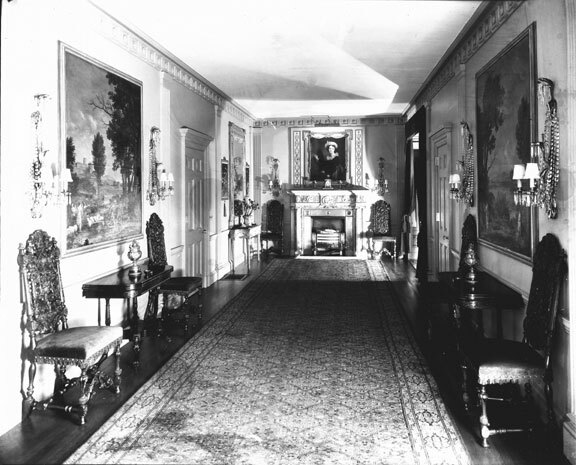 Turning back into the Red Hall, one could then head south through the Green Drawing Room, in the 18th century French style, with painted chinoiserie panels set into the boiserie, and the ubiquitous bust of Marie Antoinette on the 18th century marble mantel. 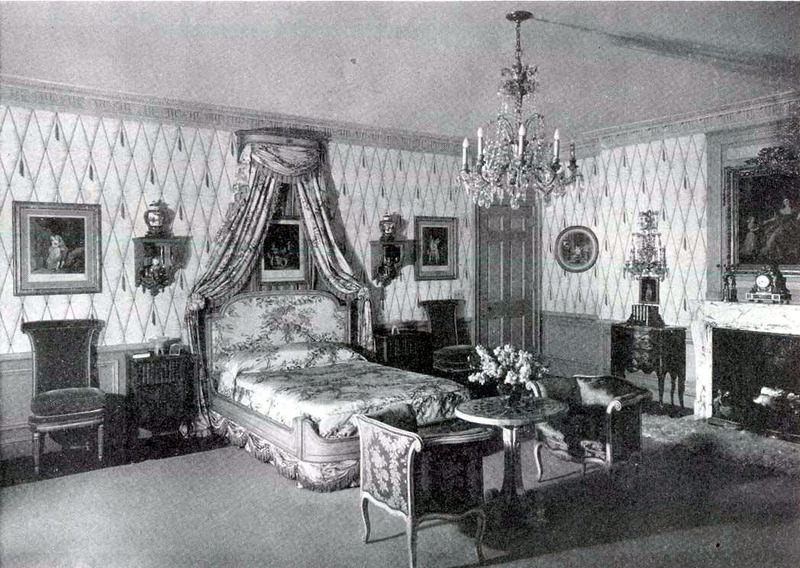 In the Cassatt era, this room had been the den, and it is amusing to compare the Cassatt’s arts and crafts sensibilities to the Stotesbury’s evocation of royalty past. 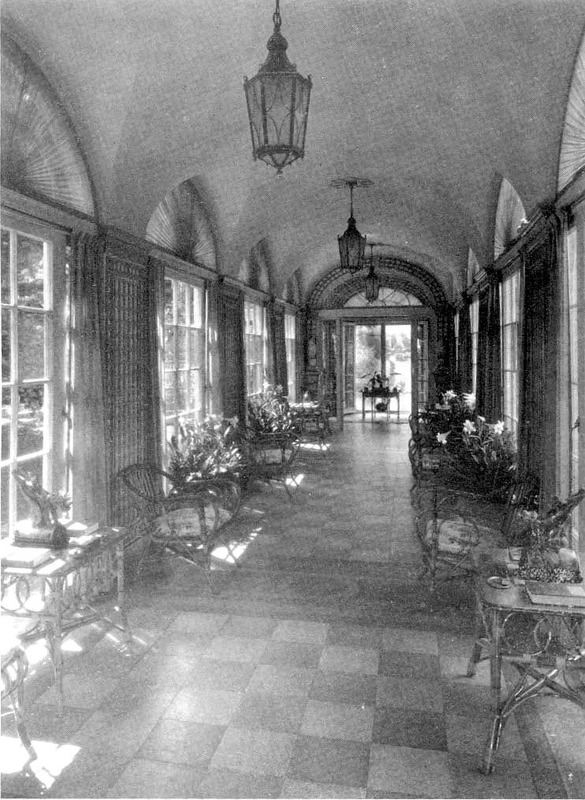 From the Green Drawing Room, one continued to the Garden Room, 60 feet long. Borrowing design details from the dining room at Syon House in London, designed by Robert Adam, the version at Wingwood house was specially designed for the set of Adam furniture that furnished it. The room was equipped with hidden speakers and a motion picture screen and projection booth, great luxuries for that pre blu-ray era. From the garden room, one proceeded into the south arcade, which in turn led to the domed tearoom By the time a guest arrived here for tea with Mrs. Stotesbury, one had traveled an indoor distance of over two hundred feet from the front door in the opposite wing. 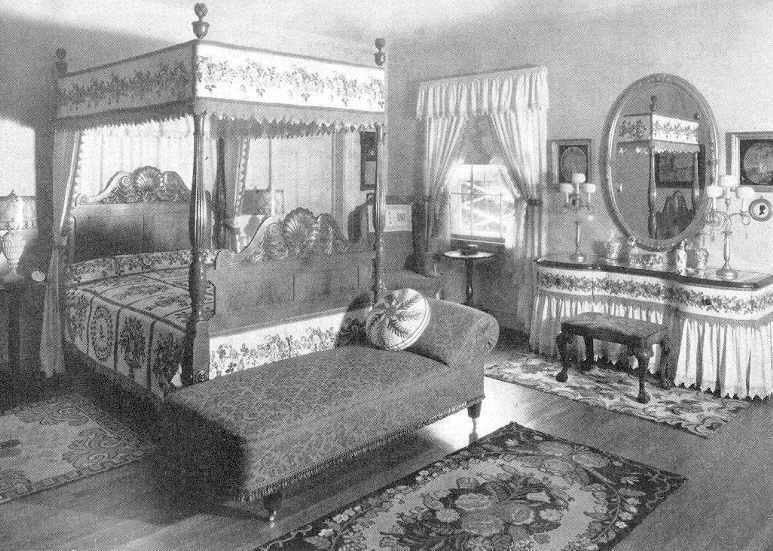 Two Views of Mrs. Stotesbury’s Bedroom. 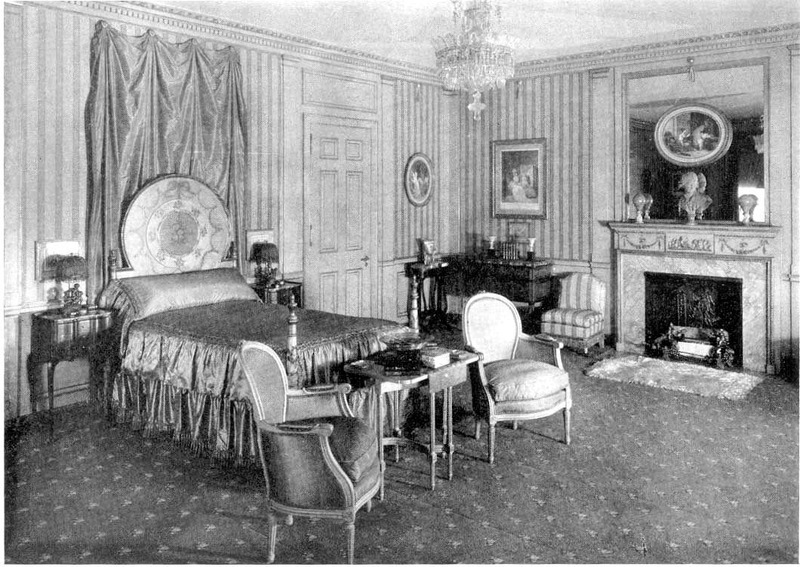 Her suite included a boudoir, dressing room, bath, and ‘hideaway’, with massage table. 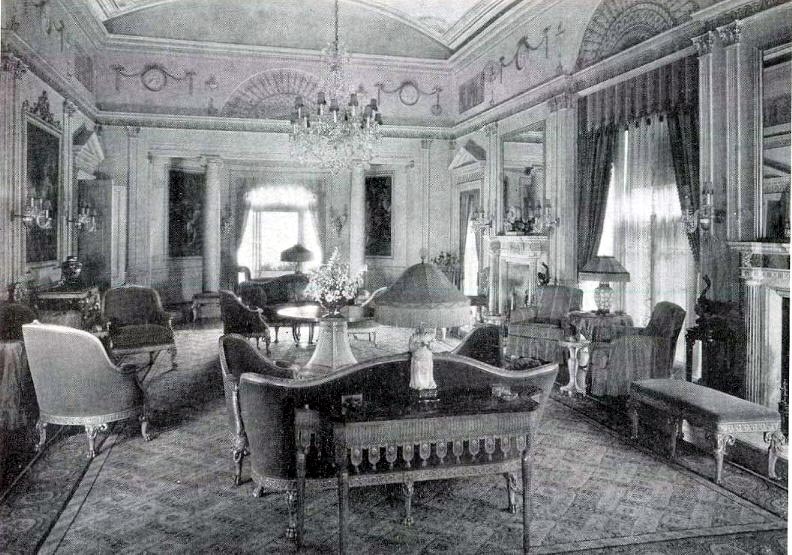 The second floor sitting room, opening to the curved portico on the ocean front. The Colonial guestroom on the third floor. The depression took its toll on even the Stotesbury fortune. 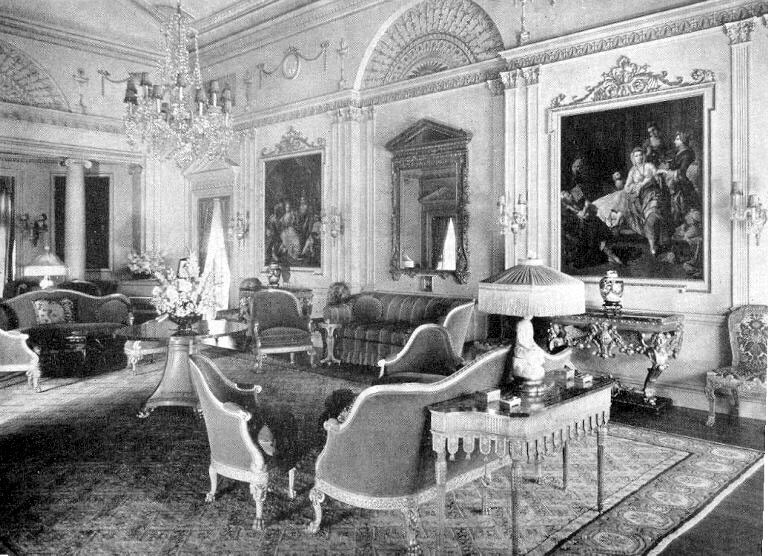 Mr. Stotesbury died in 1938, leaving a mere ten million—over a hundred million in today’s inflated dollars—barely enough to run three palatial households. 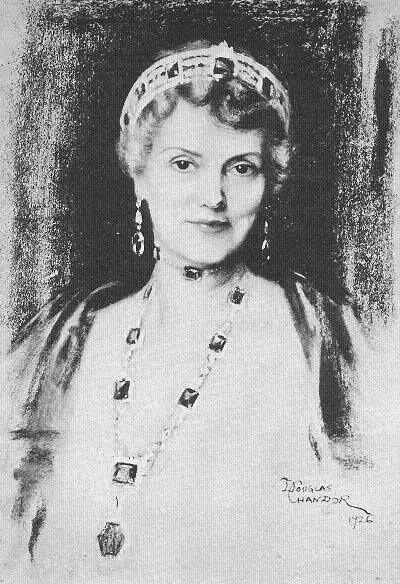 Whitemarsh, the palace in Philadelphia, was shuttered and sold to a chemical company, Mrs. Stotesbury moved to Washington, and lived relatively quietly there and at Wingwood and El Mirasol, until her death in 1946. The forest fire of 1947 spared Wingwood, but burned its ten car garage across the street. 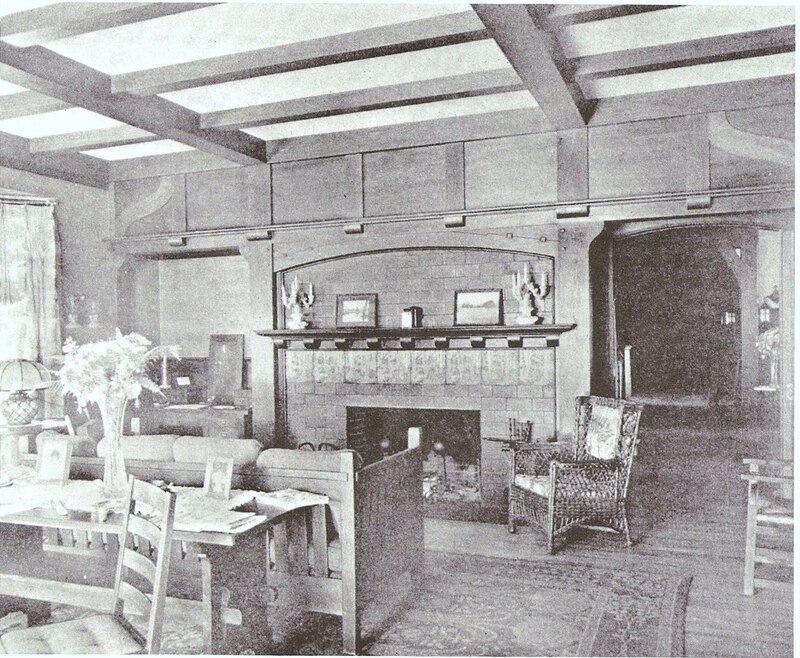 The contents of Wingwood were auctioned, the house was eventually sold to a Carolyn Trippe, who could not afford it. Abandoned and overgrown by 1952, it was purchased by the Canadian National Railroad, who intended to use the site for a terminal for their ferry service to Nova Scotia. 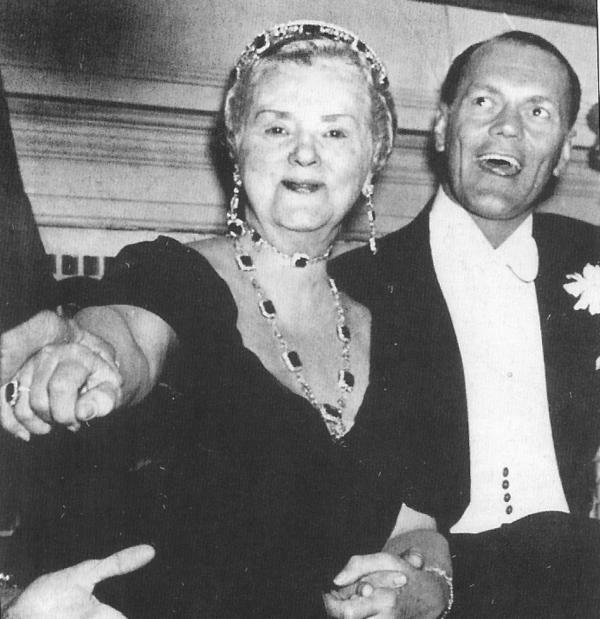 To appease the concerns of the town, the Canadian National originally said they intended to use Wingwood as the terminal and a hotel, but in 1953 changed their mind, issuing a statement that “no one is interested in maintaining these old palaces anymore” and Wingwood was demolished. 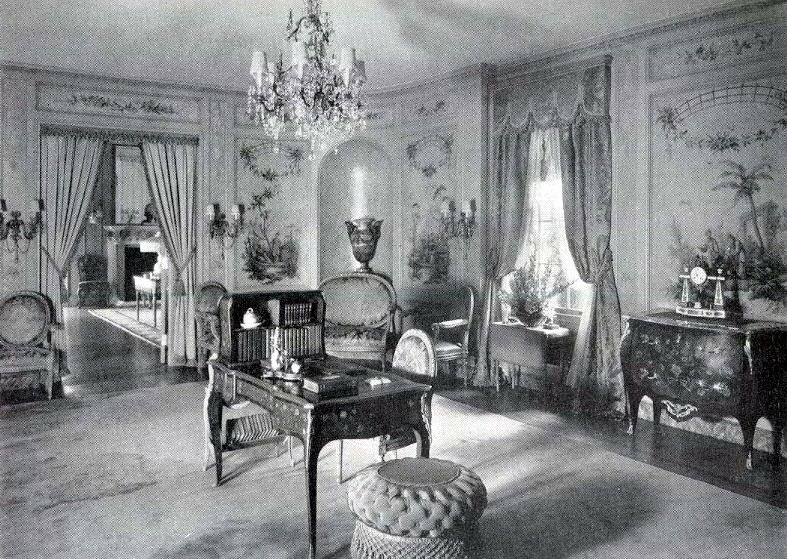 It was followed a few years later by it neighbor to the north, Hauterive, with its Duveen drawing room, and lacquered dining room by Baron DeMeyer; replaced by a motel. A couple years later, the estate to the south, Sir Harry Oakes’s The Willows, was converted to a motel, its sweeping lawns covered with lodging units. 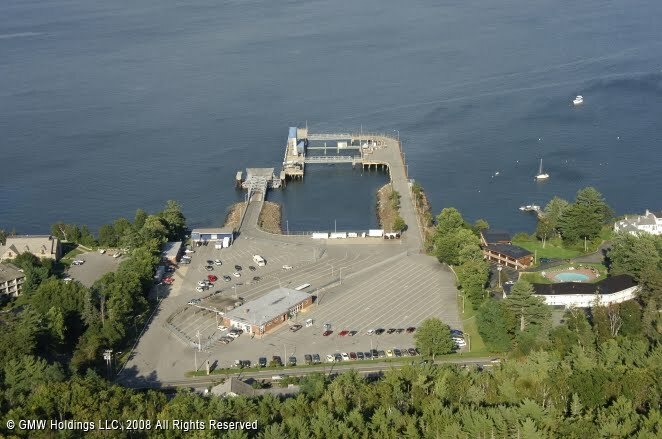 The old Bar Harbor was gone. 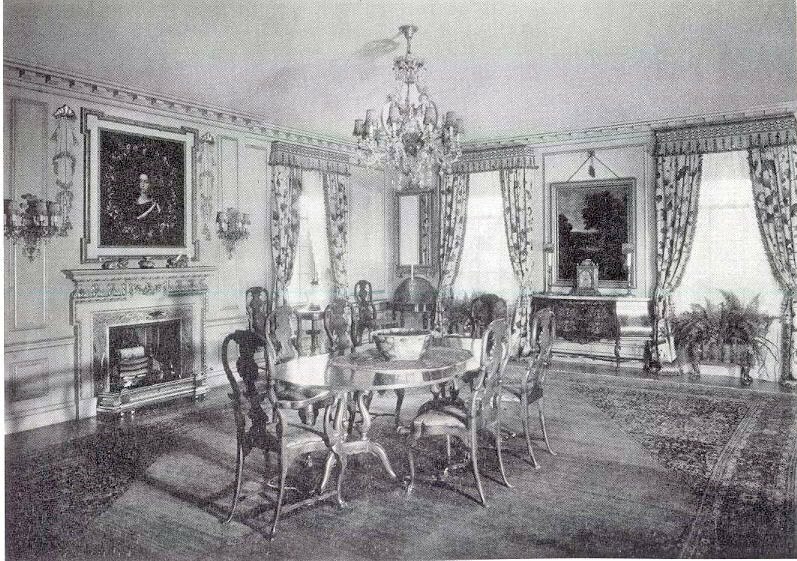 The elaborate 80-room Wingwood produced a great deal of architectural salvage. Several of its decorative components can be seen on houses around Mt. Desert Island. 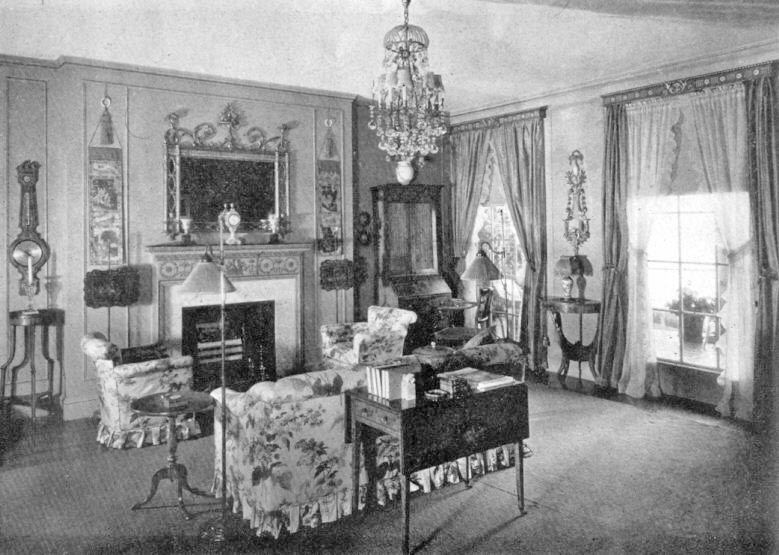 A mantel showed up in a Christie’s sale. . Over the years the trumeau from the red hall, a pair of columns and a sofa, the mantel from the Apricot guestroom have all passed through my hands, and other pieces keep turning up in the marketplace, even 50 years later. What an amazing three-part post! As I read through, I could not help but fantasize how I could make improvements! Of course, the interiors might need only a little editing to suit my own taste. The exterior is another story. But I do love a challenge! Many thanks for an introduction to a house that I had never heard of before.You mentioned the Geo Bush house. News photos that gave only a hint in the background made it appear a very pedestrian suburban house with no distinguishing features. Is it a good Arts & Crafts house? John Tackett: When the Bush's inherited it, they did some simplifying, and then after a hurricane, yet more changes, and some winterization, replacement windows, shingle instead of stucco, etc etc. There actually were two Walker houses on Walker's point, both by Chapman & Frazer, but the Bushes long ago tore down the other. Stay tuned. I'll post some pictures in a couple of weeks. Would be sort of fun to do a before the Bush's and after. Fascinating post. What an amazing confection, and indeed of European palatial qualities and volume, which are perhaps less attractive to live in (today) than to look at.One can't help but think that the artists rendering of Mrs Stotesbury was very kind indeed!Thanks for stopping by. Your posts about this house are fantastic! 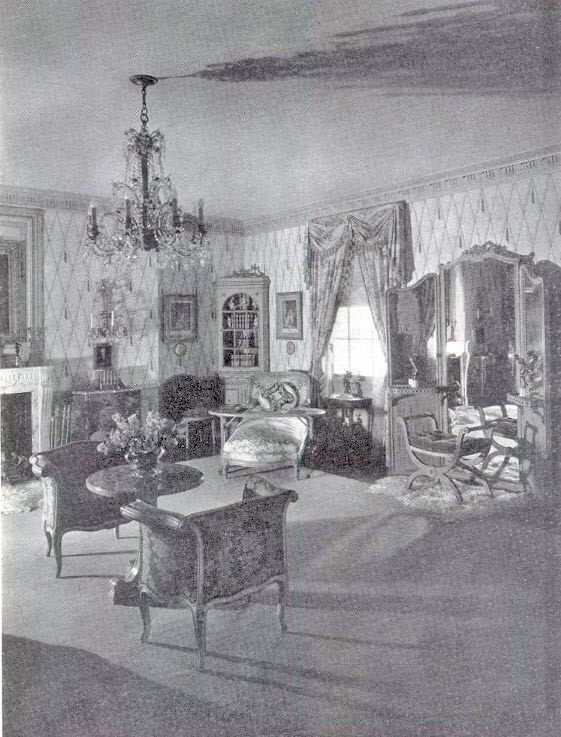 !I'm curious about something: Although I have heard stories about the legendary suite of furniture that Lord Duveen sold to Mrs. Stotesbury, I don't see a single piece of it in the photos of the room. All of the furniture that is visible is clearly not 18th century and certainly not Adam. Have you seen any of the pieces in your travels?Also, I have heard that Mrs. Stotesbury tore down the Cassatt house completely before building the Howard Major house. 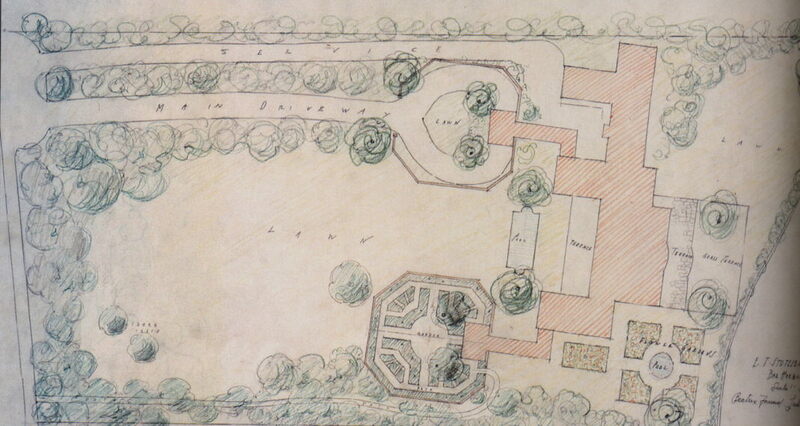 Then, supposedly, she tore down the Major house to replace it with the Magaziner house. Is this possible?Thank you. Anonymous. Lots of interesting questions. 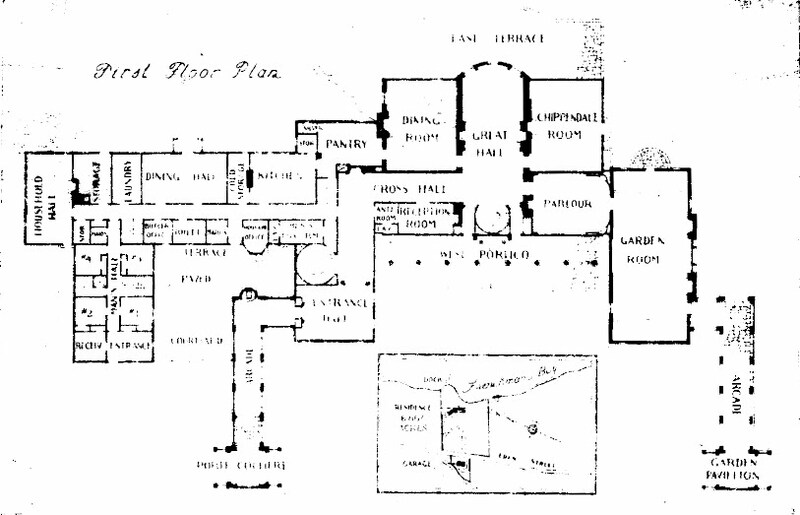 In stories like this, it is hard to separate fact from urban legend, especially as the legend grows over 80 years, and the primary sources are lost to time.If indeed she kept the Cassatt house, its trace survives in the four chimney stacks and basic floorplan of the main block of Wingwood, as does the stair in the central hall, located where the Cassatt stair was. I get the feeling that the Cassatt house was indeed embedded in there, and that would also account for the awkwardness of the new wings to the center portion, and the scale issues. My understanding of the design process is that the Major house was still in design and early stages of construction when her unhappiness festered and he was replaced with Magaziner, and that the scaling up occurred when the suite of furniture was purchased.I respectfully disagree with your assesment of the suite of furniture in the garden room (although absent any of the actual pieces in hand,one cannot say anything with certainty. The auction catalog lists the two sofas and the side chairs as period, for what it's worth. Much of the other stuff, clearly, is of the 1920's. 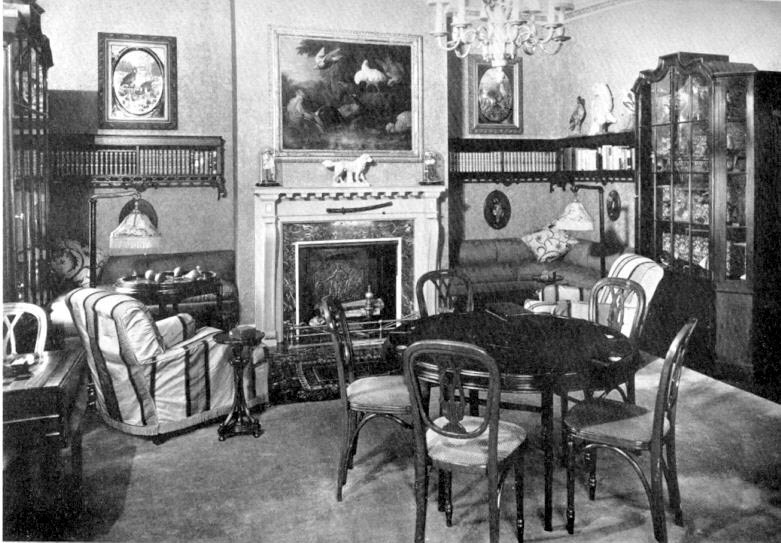 There are several suites of documented Adam designed, Linnell or Chippendale crafted furniture that survive in the style of these pieces, in fact. DED- How I missed this post until now, I'll never know. I have long been fscinated by the Stotesburys and their houses, and have despaired, until now, of seeing interior shots of Wingwood House. You are indeed a gem, but I've known this from the first time I read your blog.There is a wonderful book called The Twilight of Splendor which chronicles four or five of the last really great estates built in America, including Whitmarsh Hall, the Stotesbury's Philadelphia eye boggler. If I remember correctly, Twilight of Splendor states that Mrs. Stotesbury began her work at Wingwood with Horace Trumbauer- and drove him crazy by continually sending him photos and suggestions of Colonial detailing of much smaller houses with instructions that they be incorporated at Wingwood where they would look ridiculous when scaled to the size needed. 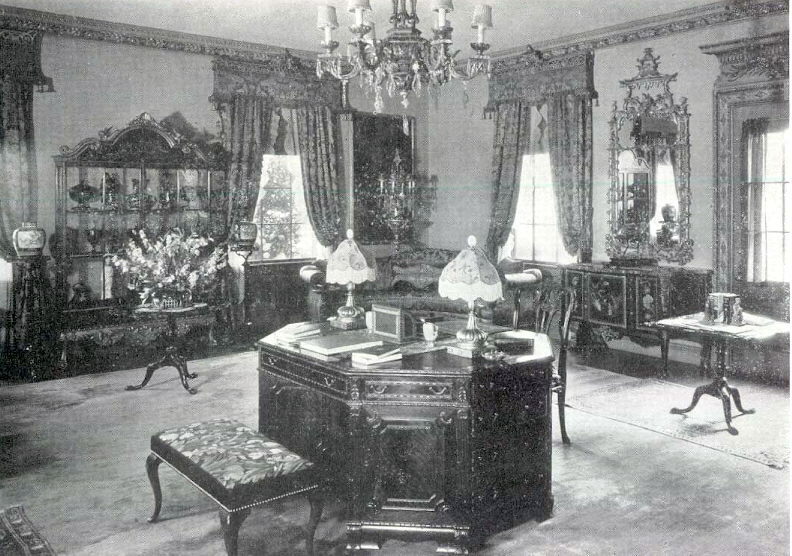 And like Whitemarsh and El Mirasol in Palm Beach, Wingwood was a pastiche of good paintings, a few very good pieces of period furniture and a great many very well made reproductions. It is pretty much what you would find in any similar house of the period- an era when the rich had a far more robust attitude towards antiques than they do today.Any sense on how the auction went? Today, "celebrity" auctions seem to guaranty sky high, out of the ball park prices. That was not the case years ago. I'm sure we would shudder if we knew the "give away" prices at which Wingwood's contents were knocked down- viewed as a great deal of bulky trash by buyers who had dozens of similar auctions in resorts up and down the East Coast from which to chose.Do copies of the catalog ever come up for sale? I would dearly like to buy one.Feel better. Nothing worse than a summer cold. DED- Ignore my previous comment. I had not seen your part 1 and 2 (bad search engine at the office- where I probably shouldn't spend so much time looking at DED anyway). You've explained it all and provided so many fascinating details that I despaired of ever getting.Excellent series of posts- and at least one chapter in your first book. I'm serious. DED- your wonderful posts on Wingwood have been much on my mind, hence the number of comments I have made.I was thinking about certain architectural styles and what makes them particularly suited, or ill suited for various uses. Colonial style architecture has its own challenges, and seems loses all that makes it charming and pleasing when it is blown up to overly large proportions. As enormous as the classical style Whitemarsh Hall was, as far flung as El Mirasol was, they were very clearly private houses. Wingwood, however, looks to me like a grand summer hotel. The same can be said about Marion Davies' Ocean House: As jaw droppingly huge as San Simeon is, it still retains a residential air. Ocean House, though, had a distinctly commercial feel to it. Perhaps all those Colonial and zfederal details were simply never meant to be rendered at 5X their original scale.Hope you're feeling better. 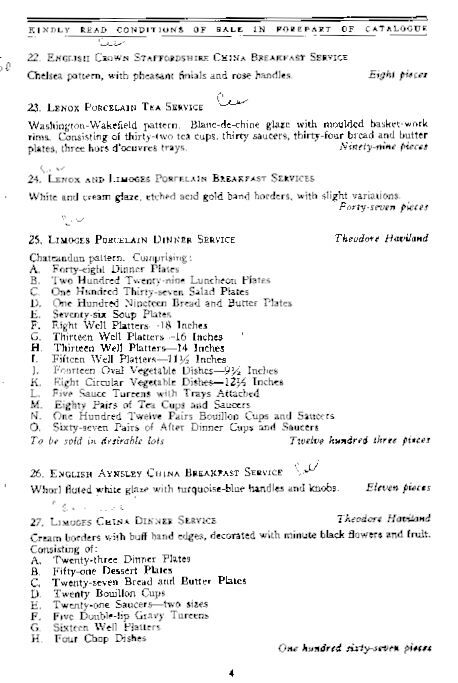 i have been amazed at the mile-long list of dinnerplates of the stotesburys..i can imagine how big they entertained… do you have more scanned pages of wingwood estate catalogue when its contents were auctioned? DED- this is an amazing photograph of Eva Stotesbury. I’m wondering where you found it? Would love to find a large image.